The Fairmont Anaheim Hills campus is proud to spotlight fourth grader, Anastasia Huddleston in our first “Student Spotlight” feature. Anastasia has been a student at Fairmont since pre-school and maintains straight A's in Miss Romo’s Fourth Grade class. 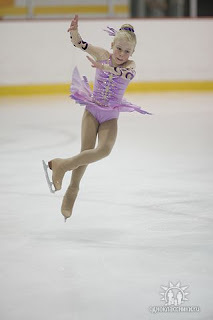 She has been figure skating for the last 6 years, since she was 3 years old! Anastasia skates 6 days a week, for at least 8 hours a week. Her practices are very intense, but she truly loves working on her routines. She is coached by two-time Olympic Champion, Ekaterina Gordeeva. Off the ice, Anastasia works on conditioning, strength training, stretching and ballet to improve her overall skating skills. She is very competitive and always places high in her competitions; in her last two state-wide events she placed 2nd and 3rd. Anastasia’s goal is to compete in the Olympics someday. In addition to figure skating and maintaining straight A’s, Anastasia also attends Russian school on Saturdays, where her favorite subject is drama. Congratulations, Anastasia, we are so proud of all your successes!